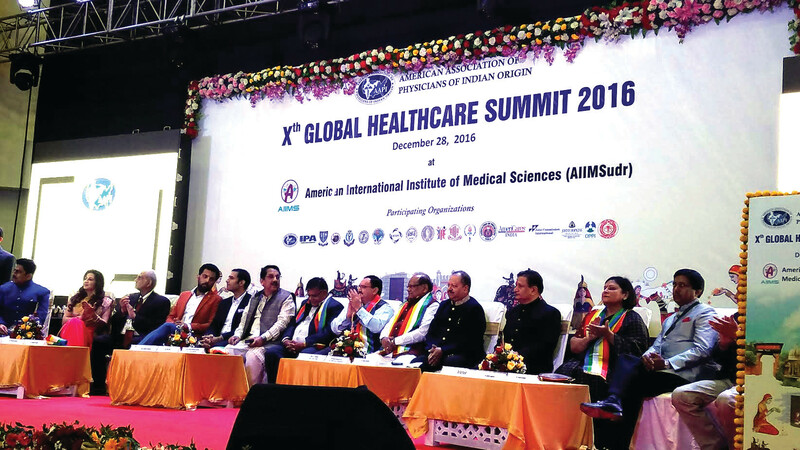 Dr. Ajay Lodha, seated tenth from left, along with other health care leaders at the AAPI Global Health Care Summit in Udaipur, Rajasthan last month. India has proposed to develop a “structural relationship” with the American Association of Physicians of Indian Origin as the country seeks to make a positive change in health care scenario so it can provide a high-quality and affordable care for all its citizens. “Let us develop a structural relationship between AAPI and the government of India,” Jagat Prakash Nadda, Minister for Health, told the hundreds of international delegates while inaugurating the 10th annual Global Healthcare Summit 2016 Dec. 28 in Udaipur, Rajasthan. Organized by AAPI that serves as an umbrella organization for more than 160 member associations nationwide, the three-day GHS 2016 offered a platform to nearly 100,000 physicians of Indian origin it represents to explore ways to giving back to their motherland. “It is your love for your motherland that has brought you here today,” Nadda said as the audience cheered him loudly. While describing them as leading luminaries, excelling in the medical field, contributing to make a positive impact in the healthcare sector through their dedication, commitment, knowledge and skills, Nadda, who is a physician himself, said, India is optimistic about making a positive change in the health scenario of the country. In his introductory welcome address, Dr. Ajay Lodha, President of AAPI, said that the GHS has come to be recognized as a truly pioneering effort to address areas of concern which are of significant consequences on health care scenario in India and noted that past summits have identified areas of mutual interest and also integrated advancements of healthcare facilities in India, besides ways and means of tackling long-term concerns leading to long-term collaborations. The minister sought collaboration with AAPI and its participation in every possible area in the large health care sector in India. “You know the needs of the nation. Now, it’s your responsibility to see where your expertise and services will fit in and how you can make a positive impact in the healthcare system in India,” the Minister said. K. C. Saraf, Rajasthan’s Minister for Health, proposed that each AAPI member return to one’s place of birth and identify the local needs and invest one’s time, resources and talents there to make a positive impact on the health. The summit began with the first ever day-long international research and poster contest and had as many as 300 participants from India and abroad, competing at the prestigious contest. Cash prizes and Certificates were awarded at the inaugural ceremony to winners of the contest. “Our ability to share knowledge and influence the medical world has never been greater,” Lodha said. . “The advancement of modern technology, the quality of care we provide and the values that we support can reverberate around the world as never before,” he said. “While the networking and the CMEs help educate AAPI leadership and member physicians on cutting edge disease topics and cutting edge intervention, through this work during GHS 2016, AAPI is excited to showcase the full heights that Asian Indian physicians have reached, elevate educational quality, stimulate the AAPI general physician members, bring further recognition to these renowned physicians, and inspire our young physicians-in-training,” Lodha added. Dr. Patel, a pioneering Indian-American cardiologist from Tampa. Fla. announced at the CEO forum and leadership meeting, held as part of the summit, that he is ready to invest Rs. 200 crores in the state. With additional investments from the banks, Patel said that the total investment could be up to Rs. 1,000 crores in Rajasthan. He said he is willing to set up a medical college in Rajasthan which, he said, requires more trained personnel to support its growing health care needs. More than 50 opinion leaders and expert speakers drawn from major centers of excellence, institutions and professional associations from across the globe addressed the summit.